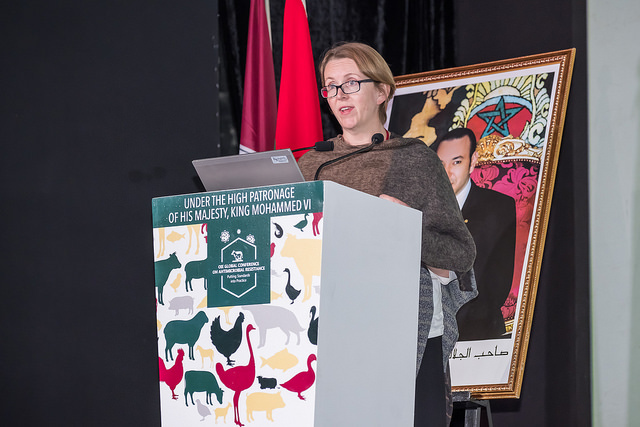 Today the work of the Codex Task Force on Antimicrobial Resistance (TFAMR) was presented at the Second OIE Global Conference on Antimicrobial Resistance and Prudent Use of Antimicrobial Agents in Animals, which is taking place in Marrakesh, Morocco on 29-31 October 2018. The World Organisation for Animal Health (OIE) is focusing on ‘putting standards into practice’ at this year’s meeting. Speaking in the session on Surveillance and Monitoring towards Effective Management of Antimicrobial Resistance, Sarah Cahill, Senior Food Standards Officer with the Codex Alimentarius Secretariat, highlighted the importance of the guidelines that Codex is developing on antimicrobial resistance. She explained that they are a means of providing its members with guidance on how to design and implement integrated surveillance of foodborne AMR and also to promote harmonization of approaches so that the information generated can be shared across sectors, countries and regions. “Implementing integrated surveillance can seem daunting, therefore the Codex guidelines aim to foster gradual improvement, by promoting a stepwise approach,” she said. The conference, with approximately 500 participants from around the world, provides an opportunity to consider how the work on AMR being undertaken by the tripartite (FAO, WHO and OIE) and Codex Alimentarius as well as different consortia, including industry bodies, can be implemented on the ground in countries. The increasing level of collaboration on AMR at international level has been well recognized but as the support to countries to meet international standards and manage the threat posed by AMR increases even more coordination will be needed to ensure such support is optimally effective. The Codex TFAMR will meet in Busan, Republic of Korea on 10-14 December 2018 to continue development of the draft Guidelines for Integrated monitoring and surveillance of foodborne antimicrobial resistance.